Here at Logic4training, we endeavour to provide you with access to both high-quality training and as many opportunities as possible to be able to learn new skills. We understand that with advances in technology it can be hard to keep up with what skills you need for your job, or if you’re planning on changing careers it can be hard to obtain the qualifications needed. Not to mention fitting study time into your busy life. With this in mind, we created a brief questionnaire with the aim of discovering your thoughts on further education and training and how we can improve our services to help with this. The survey was conducted in March 2016, and the responses we have gained have helped us understand how you learn and when you’re prepared to train. We have collected the data and extracted some of our findings below. Over 51.4% of survey respondents said they would consider going back to education to learn more skills. Of those asked, 20.6% said the decision would mainly depend on cost. 8.3% of respondents said that they would consider paying £2000+ if the course were right for them, but the majority, at 26.9%, remarked that they wouldn’t pay for training. 49.6% of those questioned answered that they wouldn’t travel more than 10 miles to a training centre and 15.6% prefer distance learning using online methods. 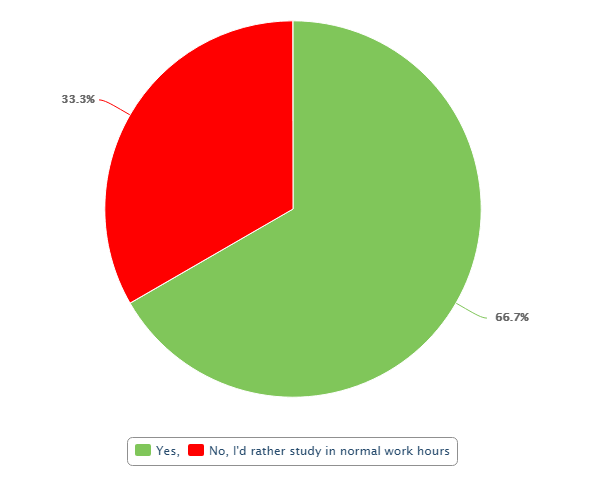 71.6% would give up their personal time to study in the evenings and a further 66.7% are prepared to train at weekends. Would you study on weekends? Technology has changed the way we learn according to 51.4% of participants. Many stated that they learn using online resources and have greater access to information thanks to these media, including doing research using YouTube videos and other audio-visual sources. When it comes to training, 78% of us find it easier to learn by doing, while only 23% learn through theory. The survey has revealed that we’d much rather be taught by an industry professional: 72.2% agree that this is how they’d prefer to learn. Throughout our study, we were interested to find out more about attitudes towards having to pay for certain training courses and whether our participants are willing to give up work or their spare time to gain more qualifications. The end results reflect that whilst we’re eager to learn more, we’re restricted by finances. Most counteract this by researching new skills online and credit technology for being able to learn more and, in turn, gain access to this information more quickly.